That sounds great, but how would it work? Subsidiarity goes beyond the typical “states’ rights” argument put forward by the political conservatives of the United States of America. While some in the USA who argue for states’ rights might regard it as a necessary first step to further decentralization of government authority, others voice a “let the states decide” attitude which seems to indicate that their only real objection to certain government laws is the fact that it is the federal government imposing them. Their statements suggest that the same laws would be fine if imposed at the state level without any further decentralization of authority. Listening to some of their arguments seems to give the impression that they don’t really recognize that the centralization of power, even to the state government, makes government less democratic. The more power gets centralized, the more undemocratic the government becomes. They only seem to be concerned when the exercise of power crosses the line from state to federal authority. In reality, however, it is only at the local level that the average citizen really has a voice. Therefore, the more localized the authority, the more democratic the society. The sad truth is that so many of us have become too accustomed to the idea that the higher levels of government is where problems really get solved. We pay more attention to state and federal elections than to local ones precisely because the authority which naturally belongs at the local level has been usurped by state and federal governments. “I will write my congressman,” and “I’ll take this all the way to the Supreme Court” became the reaction, and the reality, of how we view the political process. While we in the USA believe ourselves to be a bastion of democracy, we have allowed (and assisted) the gradual stripping of our democratic voice. This has gone beyond the making of our laws and the defending of our rights, but even to how we assist those in need. As a society, we have gotten to the point that we automatically look to higher and higher levels of government to resolve even local issues. It is sad, but it seems that most people believe that the higher the level of government, the broader its scope of authority. Distributism, on the other hand, argues that the higher the level of government, the narrower its scope of authority. The question is how this can be applied in a practical and workable way. While there may be variations in application due to cultural differences in different regions, a basic outline can be presented as a starting point. The foundation of this outline is to understand the “orders of society” and their relationship to each other. The “lowest” order of society is the family, not because it is the least important but because it is the most. It is the very foundation of society. Above that are religious, occupational and social groups which are free institutions for the mutual support and benefit of their members. 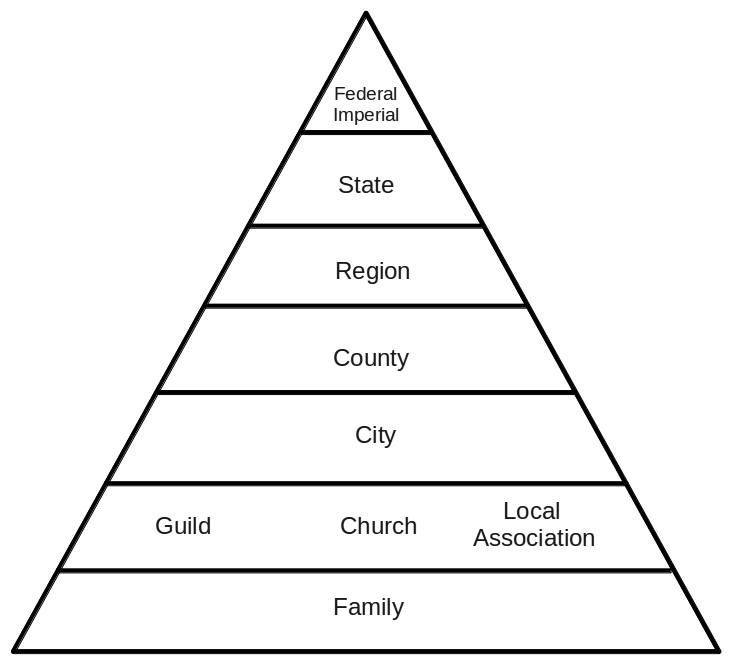 The remaining “orders of society” would refer to the different levels of government starting with the local community and moving up from there, each fulfilling only those functions that, by their nature, cannot be fulfilled by the level immediately below it. From the distributist perspective, local issues should be handled as locally as possible. Even if an issue exists across a larger region, each locality should be left to direct how to handle it within its jurisdictional boundary to the greatest extent possible, even if assistance is needed from higher levels of society. This is a fundamental concept to understand about subsidiarity. When an issue arises that needs to be addressed, the level of society where that issue arises is the natural point where the issue should be addressed. In cases where it cannot be addressed there, the members of that level would petition the next higher level of the orders of society for assistance. Therefore, if a family is in financial need and needs immediate assistance, they should naturally turn to those societal organizations like church, work association (guild) or other social organizations for assistance. If a particular vocation needs a school to provide training in the skills it needs, it should first look to the members of that vocational guild. If it cannot provide for itself, it can look to other guilds of the same vocation, or even discuss combining resources with other guilds to establish schools to meet their combined needs. It is only if these first attempts cannot resolve the issue that governmental bodies should get involved, and then only by petition of the immediate lower level. If, for example, a lot of families in the community needed assistance and churches and other local associations found themselves unable to adequately provide that assistance, they could raise the issue to the city or to related organizations in other areas. If a city was not able to address an issue, it could ask nearby cities for assistance or raise the issue to the county. In this way, each level of society would render assistance based on the need asserted by the level immediately below it, and that assistance would not usurp any functions of the lower orders of society even if the higher order needs to coordinate the activities of the lower orders due to the nature of the situation at hand, like a natural disaster. This process keeps as much authority as possible at the local level and, by doing so, preserves the ability of citizens to effectively curtail the usurpation of authority by higher levels of government. Because the greatest level of influence is the most local level, and because the individual citizen’s vote has its greatest influence at the most local level, this process preserves the greatest level of democracy for all.